Join the discussion on our forums! Come discuss Ectomancy over in our dedicated Ectomancy discussion topic. Your best chance of playing this is when your opponent kept up a Doomguard for some reason, or you just have a fat board that still exists one turn after Gul'dan. You can't get enough value out of this card, and it won't be an OTK this expansion either. Summon Doomguard from Skull, Cube it, Pact the cube, Bloodbloom into Ectomancy. Boom, 20 damage. Sure, 20 damage... on turn 8. Your opponent is either out of steam, has much more than 20 health or has planted a ton of taunts. In addition, you need the magical control of not having Skull equipped/doomguard in hand up until turn 8, and when your turn 7 is just tap + skull you leave a big window for your opponent to Ooze without punish. Also, 6 card combo for 20 damage, I think I'll run an actual OTK deck. Can u fit this into argo deck as a finisher ? Seems like just a win more card..don't even think it's that strong for a win more card, and very clunky. Not sure why many people are overrating this card. This is going to be an OP card. Imagine two [card]Doomguard[/card] and you play this that's another +10 damage or even comboing it with Void Lord. Looks like another Warlock meta expn. I mean Cubelock is already pretty bad right now after the nerfs. You need two demons on board to get value out of this. Why ever play this over Faceless? This is just a win more card. You're over-valuing this pretty hard lol. If you're ever in a position to play this you were likely just winning anyways. Might be awesome in some heavy demon setups! Although I'm afraid of demon swarm after the stream. Outstanding! The best card for Cubelock I have seen! Seems cool but inconsistent. People always post about these cool combos that can be pulled off that are just so unrealistic lol. 7 card combo that requires you to draw Skull then get a Doomguard in hand and have all these cards ready to go. Just way too unlikely. Also forgetting the fact that Spiritsinger, Cube and Dark Pact all together are 10 mana. So this is a 12 mana combo so you can't even do this in one turn anyways. At that point next turn why even play Bloodbloom it'd just be another card for this unrealistic combo. 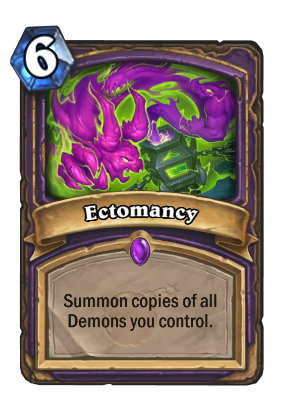 Might as well just play Ectomancy by itself to cut down on "combo" pieces and then you're sitting at a 16 mana "combo" that takes two turns and you need to hope your minions don't get removed.